Here we are winding down another year. 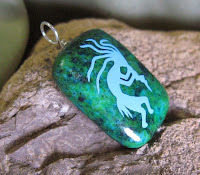 Native and Pilgrim, my humble Etsy shop, only had 17 sales during 2011. Despite how dismal that sounds, several of the sales had great stories behind them and left me feeling pretty good. One sale was to a childhood friend and her compliments on the earrings she bought really lifted my spirits. The last sale of the year (so far) was to someone in Florida who was giving the jewelry as gifts to foreign exchange students who love Native American items. I joked in a post on my Facebook page that I hoped they didn't expect it in time for Christmas. 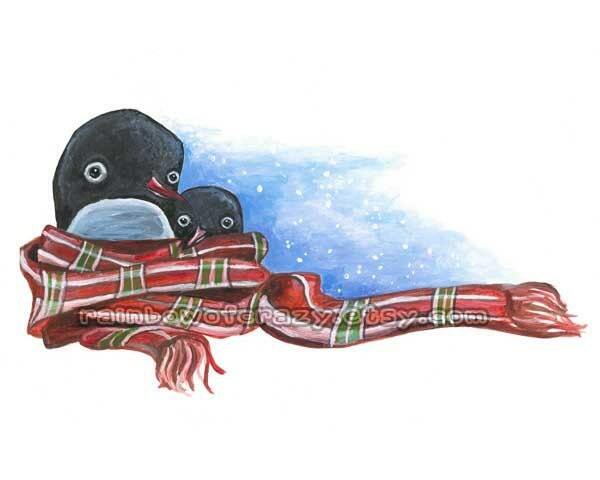 This was before I read the anxious note from the buyer about wanting them for Christmas gifts...Note to self - remember to check Paypal AND Etsy for notes from the buyer next time. You may have noticed (I really hope you noticed) that I've been absent the past month. My bout with illness (sinus infection, pneumonia, etc.) went halfway into December. I barely made my deadline for designing the playbill for Heritage's production of A Christmas Carol and then was backstage during the show to help with props and costume changes. Then came preparations for Christmas...time really does fly! For my own sanity, I just had to let the blog take a break for a bit. We've learned a lot and it's enough to keep us going for a little bit longer. I have to admit I'm absolutely addicted to my iPhone. It just tickles me to be able to scan my prescriptions to order refills. Nothing makes you feel more powerful than pulling up info in seconds - I can answer trivia questions, identify the song playing, track my health statistics and share them with my doctor, check sports scores and schedules, buy movie tickets, manage my bank account, and more. What has been missing since I got my iPhone is an official Etsy app. There were a few apps that allowed access to Etsy, but the reviews couldn't convince me to purchase them. I didn't want to shop Etsy from my phone. I wanted to manage my shop from my phone. Etsy has now released an iPhone and Android app and it's FREE! I'm just beginning to check it out, so I can't tell you much yet. The first thing I tried was looking at my expired listings and I was able to quickly and easily renew an expired item. Awesome! I like knowing that I can be selling live and deactivate items in my shop as they sell rather than putting the whole shop on vacation to avoid duplicate sales. If you've tried the Etsy app already, let me know what you think. All you sellers out there - is this something you will use? I know I will! Let's promote handmade items and Small Business Saturday as we hit the biggest shopping weekend of the year. 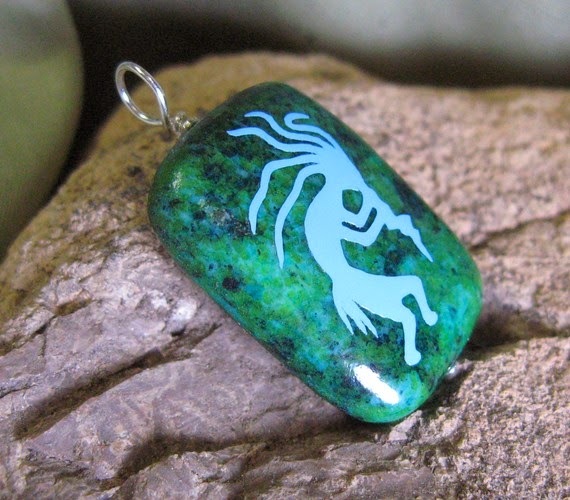 I chose this week's featured shop simply because of the name: Rainbow of Crazy. Oh, the value of a catchy name! The shop is owned by Joanna and showcases the art she loves to create and that makes her smile. Browsing through her art definitely made me smile. Something interesting occurred to me as I looked at our Etsy shop stats today. Having a higher priced item in our shop isn't a total waste. Even though we don't seem close to selling those heirloom quality tatted baby booties, lots of people seem to be looking at them. There's something fascinating about "window shopping" or looking at items you probably won't buy. For those of us who remember the days of the printed catalog, there was something magical about flipping through the Sears, JC Penney, or Montgomery Ward catalog. The baby booties don't have to sell in order to be successful. People browsing on Etsy and hopping over to look at the booties are introduced to my little "catalog" of products. That could lead to sales or even shoppers sharing my products as "favorites" with their friends, bringing even more people to my shop. This weekend, we set up a table at the Utah Valley University Powwow. Although we expect to sell more of our Native American items there, sometimes its my fancier tatted necklaces that get people's attention. My favorite "showcase" piece is this peach colored necklace with beaded flowers. I was almost disappointed when a woman purchased it Saturday. Don't be afraid to throw an item in your shop that seems impossible to sell. It just may be the item that brings people into your shop to look around. I'd love to hear about it. I tried posting this last night, but lost everything when my computer froze...so I gave up. Please forgive my absence. After dealing with illness for the past couple of weeks, I finally went to the doctor and found out that I have pneumonia. With some events coming up that I plan to sell at, I realized that I needed to have an updated inventory of my products for sale. This week is our annual holiday boutique at work and they have a central checkout system. That means labeling every item I plan to sell and giving them a list of products so we can reconcile things at the end of the boutique. If you haven't been keeping your inventory current, this is a very time consuming process. Etsy does help you a little with getting your product information into a list. In the "Shop Settings" area, click on "Options." On the page that comes up, there is a tab for downloading data. By downloading a CSV of your shop inventory, you will have a lot of the hard work done. A CSV is a comma separated values file and it will open in pretty much any spreadsheet program. When I downloaded my shop list, I discovered just how many items I hadn't managed to add to the shop yet - oops! Our next event is a powwow at Utah Valley University. No central checkout, so we need to stay at the table to sell our stuff. 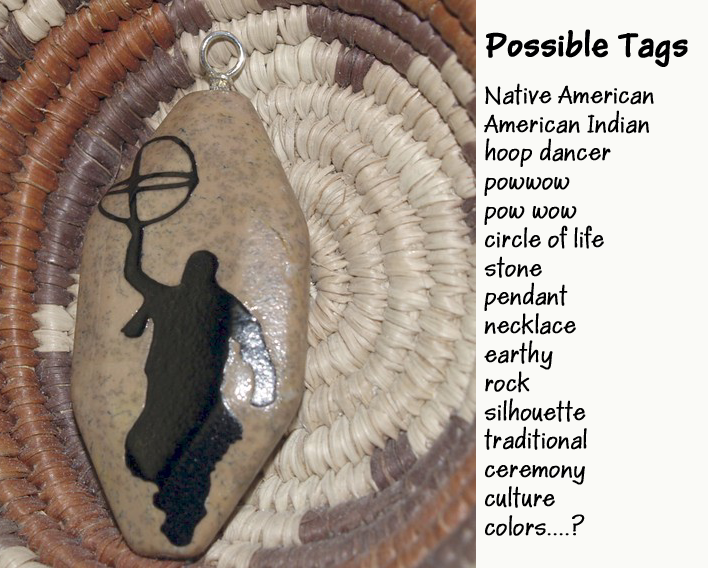 Since many of our products are geared toward fellow Native Americans, the powwow is a fun place for us to be. Getting to talk to the customers is also better for our sales since people are more likely to buy when they understand what tatting is or how to work an adjustable necklace. It's also nice to be able to more flexible with our prices and to take custom orders. Do you have an inventory list? Are there any tips or tricks you'd like to share with us? Ever since I started this blog, I've struggled with the idea of what I'm trying to do with it. 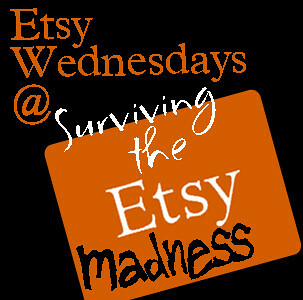 Surviving the Etsy Madness isn't the only blog about Etsy. I'm a fan of Handmadeology. They report on Etsy news and post a lot of articles about the business of selling on Etsy. I don't see them as competition because I don't have the kind of resources they do. This blog is more than just reporting the news about Etsy. It's a look into my personal journey with selling online. and I enjoy being able to share my own personal experiences with fellow sellers. You're not the only one trying to understand the terminology, hoping to find customers, and coping with frustration. When you sell handmade items, it's a very personal process. The customer who shrugs off a purchase feels like they're rejecting you personally. I catch myself wanting to ask them, "Why don't you want that? Is it the wrong size or wrong color? Is it too expensive? Are you trying to figure out how it make it yourself?" I may not handle it the right way every time, but you'll get the benefit of my experiences. 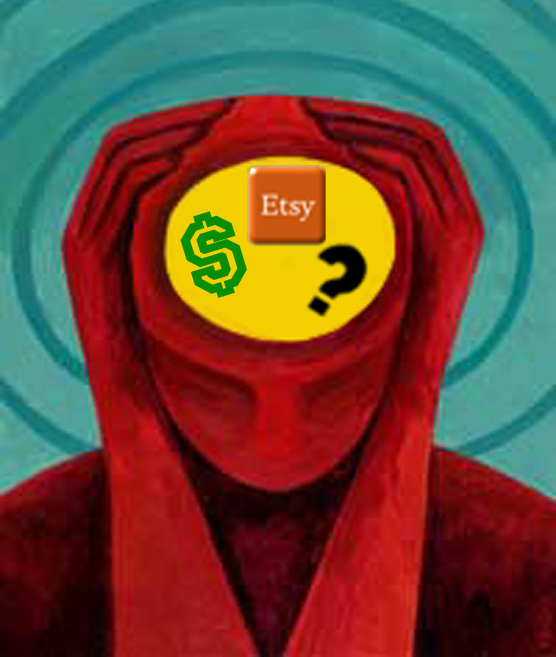 Wondering where you fit in this Etsy Madness? The biggest thing is you give me a reason to keep writing. You can join me in all this madness by sharing your experiences, tips, and tricks or by asking questions that are bugging you. I'm open to questions and suggestions for what direction to go from here. We're in this journey together! My employer, Heritage School, holds an boutique every November. Employees and community members enjoy the shopping and a percentage of sales at the boutique go to our Sub-for-Santa program. It's one of my favorites to be a vendor at. You don't have to man your booth (unless you want to) and the items are purchased at a centralized checkout. The booth charge is only $5 (or $10 if you need them to provide a table). 10:00 – 8:00 each day in the Activity Center. We would like to invite you to participate in our Boutique this year. * Booth charge will be $5.00 for a 6' space. You bring your own set up to display your items for sale. * Booth charge will be $10.00 for a 6' space including a table to display your items for sale. *Take down time is 8:00-9:00 pm. Friday Nov.04, 2011. Please do not leave items over the weekend. * Make a master list of items for sale to compare with our list of items sold (we have a central cashier). Although we take every precaution to make sure that items are not taken without payment we cannot be responsible for items that are missing. You are welcome to provide your own personnel to monitor your inventory if you have concerns. * Make sure each item is clearly marked with the price and vendor name. 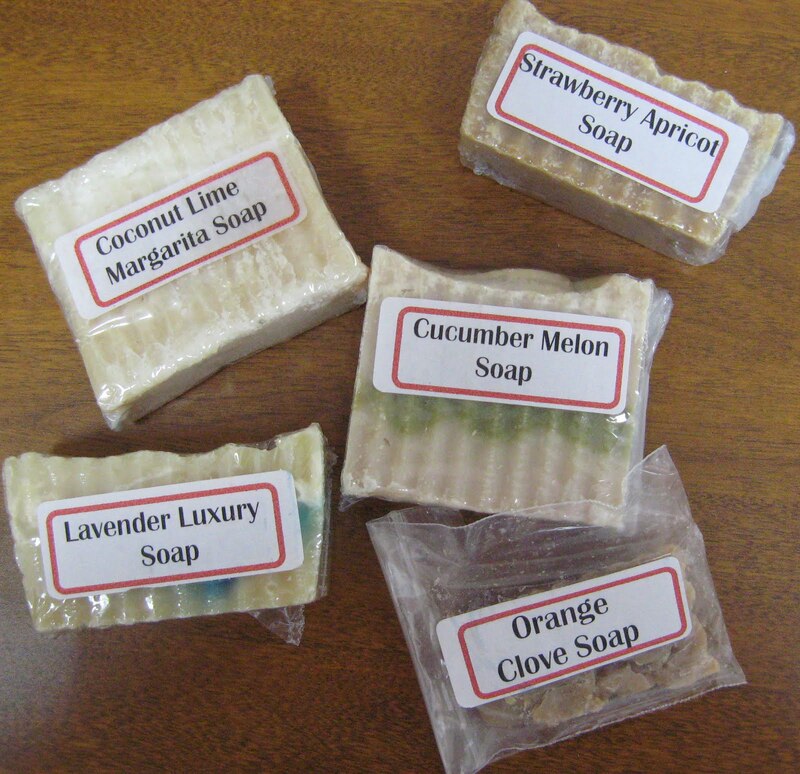 * Sales will be tabulated and a check will be mailed to the vendor within 7 working days. *Please pass this information onto anyone you know that might be interested in participating as a vendor. 801-226-4602 or bonnie.schrader (at) heritagertc.org. This week's featured shop comes from Canada. Askela Designs has been on Etsy for two years as of November. Theresa designs and creates jewelry because she loves to. Having a passion for her work must be what keeps her going. I was pleased to find some really cute non-jewelry items in her shop. 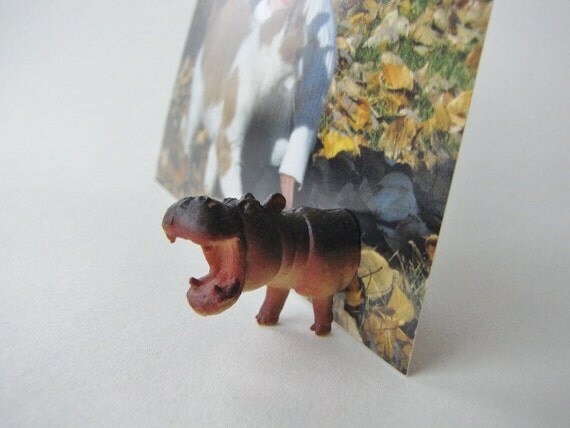 She has little animals that can be used as magnets or to hold up photos. So clever! Today is the glorious day that Etsy finally allowed us to change our shop names. For those of us who were stuck with names that we had outgrown, this is a blessed day indeed. But, for every silver lining, there certainly is a cloud. Under "Shop Settings," I clicked on "Info & Appearance." The very first item listed was "Shop Name" (not to be confused with "Shop Title," which is the next item). When I clicked on "change," I was surprised that it said you could only change the name of your shop once. Even though I was very confident about my decision to change the name, it made me pause a little...scary! Fortunately, it does look like you can try to request an additional name change if you typed it in wrong or have a legal reason for changing it. Another thing to note is that changing your shop name doesn't change your username. You will still login the same way you did before. Those of you who used your own name for this will probably be glad you did. I had to see how it would look on the Etsy site, so I played with an old treasury that only had a few items still in it. You'll see how I used to be listed when you look at the Curator spot. Your logo/photo/avatar and shop name at the time you posted it never change. Fortunately, Etsy does update the shop name of each of the items listed in the treasury. NativeAndPilgrim is too long to show the full name with the little picture listing in the treasury. When I make comments, it says "Karen from NativeAndPilgrim" and I really like how that looks. Changing your shop name will change your URL (website address) on Etsy, but all your old links will be forwarded automatically. Nobody will be able to use your old shop name either. Is anyone else changing their Etsy shop name? I want to hear from you. Bad things will happen. You can't avoid it. If it's enough of a disaster, you may have to decide what direction to go next. One of our local restaurants closed once for a leaky roof only to have a fire do significant damage a few months later. I was happy to see an article in the newspaper about the owner's decision to use this as an opportunity to revamp his business and start over. The original restaurant he opened was a buffet style place with Americanized Chinese food. Because the building was kind of run-down when they first opened, it always seemed kind of depressing. After the fire, the owner renovated the inside and the outside. It now has a sleek, modern look that gets your attention. The menu has also changed. Authentic Chinese food and all-you-can-eat sushi will certainly draw a new crowd of diners. I am sharing this story to illustrate how to turn a negative into a positive. That restaurant wouldn't have changed (not anytime soon, anyway) if it hadn't experienced disaster. They were in desperate need of change, but they couldn't see it. They were comfortable keeping on the same path. Most likely, business would have dropped off gradually and the restaurant would have gone out of business. You don't have to wait for a big disaster to make some changes. I remember looking at our business logo at one point and realizing that it didn't have the look or feel I wanted. Sales probably weren't lost to an outdated looking logo, but coming up with a better logo re-energized me and helped with promoting our shop. No money to buy new supplies? Look at what you have and be creative about making things out of the supplies on hand. Sometimes you can get supplies from people who are destashing (getting rid of their supply stash) or trade supplies with others. Sales stagnant? Here's your opportunity to scrutinize your shop and see what you could update. Rewrite item descriptions, take new photos, change the names you've given to products, etc. I'm guilty of renewing expired items without looking them over carefully. Try looking at it like a brand new product you're listing. What disaster will you prevent this week? Etsy has finally made one of the changes that shop owners have been begging for. You will soon be able to change the name of your shop. This may not be a big deal to those of you who chose your username/shop name well. For people like me, who later got serious and had to choose a business name that was more unique, getting stuck with an Etsy name that doesn't match the name of your business is a nightmare. I switched from Native Sky to Native & Pilgrim over a year ago. I don't regret changing the name of our business. It was a wonderful decision! Etsy's refusal to let people change their usernames (which are also the shop names) became more and more annoying as I would communicate on Etsy via email, forums, etc. and I was stuck with the old name. This change will come about around October 18th. 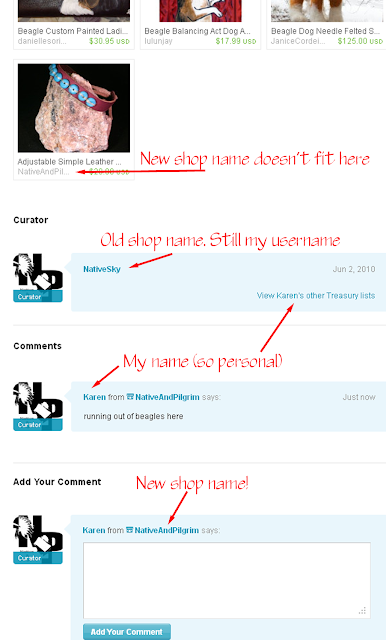 You will also be able to customize how your name is displayed when posting on Etsy. It will be nice to show up as Karen from Native & Pilgrim so people will see me as a shop owner. It always seemed awkward to post comments as your shop's name. No news yet on one of the other changes we've been waiting for. I still hold out hope that we will eventually be able to have multiple shops under one Etsy account. It would be nice to separate very different items into different shops but still be able to benefit from all the feedback associated with your business. I sure hope that one is next! Kassandra Woo of Mrs. 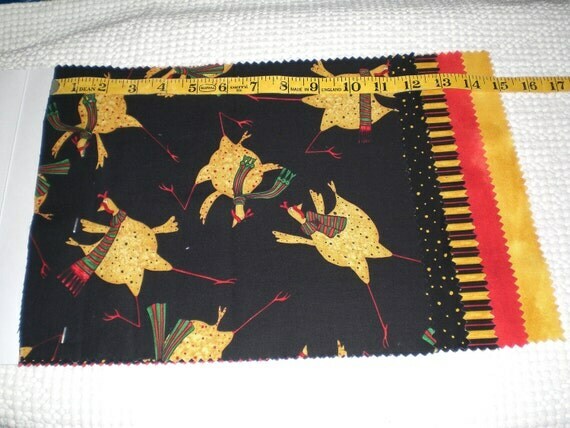 Crafty Pants Designs is this week's featured seller. What an awesome shop name! She lists her handmade hair accessories as one size fits all. That's a clever way to put it! The items in her shop are made with festive fabrics and she has something for all your holiday accessorizing. Well done! Make sure you link up to the party. You could be the featured shop next week. The term starving artist doesn't just apply to those putting paint on canvas. The life of any artisan can get complicated as they hope to make a decent income from the sales of their work. Etsy's blog includes regular articles called "Quit Your Day Job" that tell how artisans were able to make a living from their own work and stop working outside the home. Like many of you, I'm wondering if this is even a possibility in my life. The recession in the U.S. economy caused sales to drop and I haven't seen any signs that sales will improve soon. Are you thinking of closing up shop? How are you going to keep purchasing supplies and keep the offerings in your shop fresh without some significant sales? I've found some solutions that have helped me and I'm so grateful to all the others blogging out there. Blogs have become one of the top ways for companies to connect to the general public. Functioning as a combination of news and word of mouth promotion, blogs are an increasingly popular venue for products to be introduced. Often, a blog post telling about a product will be accompanied by a contest or giveaway and one or more lucky readers will get a free product. My wins include some art, a purse, craft supplies, health and beauty products, and jewelry. I have entered contests for baby stuff even though my kids are now grown up. Several friends and relatives have had babies recently and I've been able to give my winnings as gifts. Another helpful resource is blogs and sites that let you know about freebies. While some of the freebies are sample sizes, I've also received coupons for full size products. Everything from shampoos to food to fast food to dog food are promoted this way. I've even been able to get small cans of paint for free! These same blogs also link to great coupon deals. Do you rely on high priced medications that don't have a generic equivalent yet? Several manufacturers offer cards that you can use for big discounts on your copay. This has been a lifesaver for me! I don't know when...or if...that day will come where I can cut back on having a day job. I'm not even sure that's what I ultimately want. In the meantime, finding ways to save some money helps me feel better as I wait for my handmade products to start bringing in more money. I wanted to make sure I didn't overlook the Etsians selling supplies, so my pick from last week's party is The Little Shop of Stitches. This adorable shop is run by a quilting enthusiast and it gives her an outlet to sell fabric and patterns as well as connect with other quilters around the world. There were many, many fabrics that I loved in this shop, but I just had to show you the Christmas Chicken fabric sample. It's fabric like this that makes your projects absolutely unforgettable! Make sure you link up to the party. You could be the featured shop next week. No matter what hobby or craft you're passionate about, all artisans/hobbyists have something in common - the tools of the trade. Once you start making things, it's inevitable that you will begin collecting the tools needed for it. If you sew, I know you have a stash of fabric and thread that would probably rival some smaller craft stores. Do you do beadwork? I'm sure your supplies include varying sizes and colors of beads as well as several types of thread and/or wire. Unfortunately, if your passion is more on the hobby side, you probably catch some flack from others in your house or apartment for the giant stash of supplies "you never use." My husband often tells people that my hobby is collecting hobbies...and he's not far off. I love learning new skills! I'll give it a try and even buy a few tools and materials, but it all gets stashed away if I don't end up catching on or if I don't finish the project. I am famous (infamous) for my bags and bags of unfinished projects stored in the basement. It's still a good thing that I've tried to learn some new skills. Learning how to tat is the biggest accomplishment so far. I thought I'd share with you a few of my tools of the trade for tatting. This is my little bag of essentials that I take everywhere. Until I emptied it out for the photo, I had no idea that I was keeping so many shuttles in there. If you're not a tatter, you probably think it's silly to have so many shuttles. I actually have several more that are either attached to ongoing projects or stored because they have sentimental value. Most of the shuttles pictured still have thread on them. Except for the Aero bobbin shuttles, there's no easy way to switch thread. You would have to use it up or unwind it and replace it. I like the bobbin shuttles because you can change out bobbins to change thread, but I like the Lacis and Clover shuttles more for how they feel when I tat. Some items not pictured are the beads that are usually in there (depending on my latest projects) and a small pair of pliers (for working with necklace closures and earring wires). What are the tools of your trade? Tell me about the variety and where you keep it all. My pick from last week's party is Lexiphilia, Greek for "a love of words." Kasi creatively combines her love of words and love of graphic design to make these artful prints. 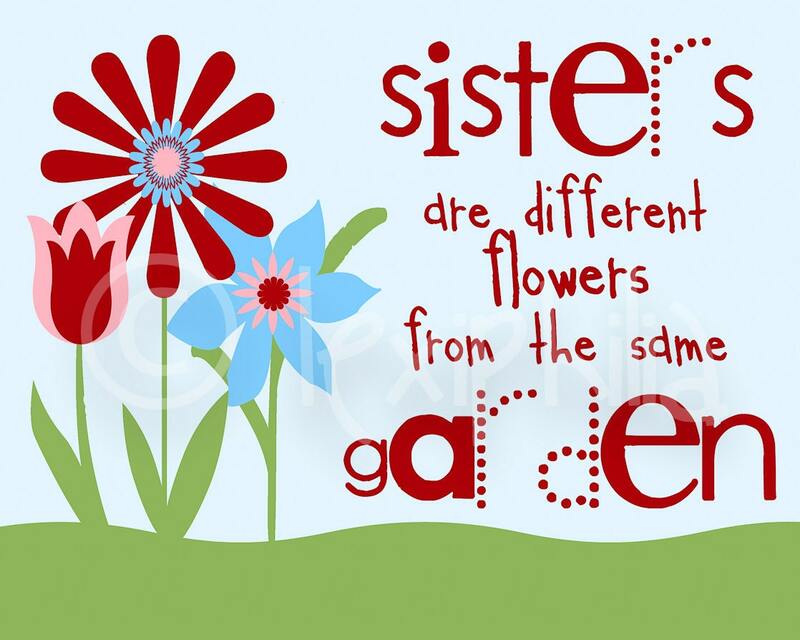 I loved this print about sisters being different flowers from the same garden. So true! Since all four of my brothers and sisters have blonde hair and blue eyes and my hair and eyes are brown, it makes even more sense. I love the variety in Kasi's shop and I'm glad she linked up last week so I could discover her shop. Make sure you link up to the party. You could be the featured shop next week. As usual, I keep playing with my tatting. I love to try new things and see what happens. Hardly anyone sees all the mistakes along the way - thank goodness! 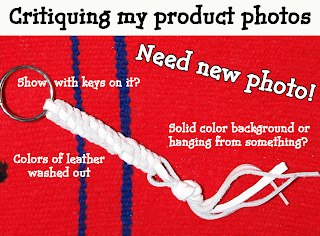 My latest adventure came about when I picked up some leather lacing at a really great price. I thought it would be fun to join the tatting to the leather to give a burst of color to the necklace. Then I reached into my stash for this beautiful piece of shell that goes from a whitish sea green to black. To bring out more of the green, I added some green frosted glass beads. The result is a very bold piece. Tatted lace, glass beads, leather, and shell. The toughest part about making it was the weight of the shell pulling on the thread. I was determined to join the tatting to the shell rather than using a metal ring or bail to attach the shell to the necklace. I haven't made up my mind yet about where this necklace will go. Yes, I'd love to keep it for myself. I am also considering donating it to the Scholarship Gala that I'm helping to organize. The funds raised by the auction provide scholarships for our graduates who want to go on to college or trade school. I know several of the students who have received scholarships in the past and I know how much they need our help. Not sure what my next tatting adventure will be. 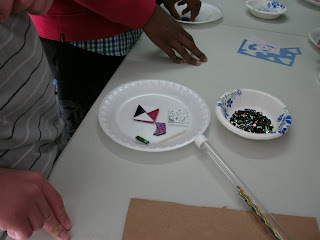 What fun mixtures of materials have you worked with lately? One of the advantages to purchasing directly from the artisan is the possibility of customization. Many Etsy shops already offer listings that are made to order, with color, wording, sizing, or other options. With Christmas approaching, many people like to request custom projects for their most important gifts. Etsy's Alchemy feature was popular before it was discontinued earlier this year. You could list a request for a handmade item and sellers would send you bids with information on the price, timing, etc. There were definite problems with how Alchemy worked, but the basic concept was a good one. When Etsy took Alchemy off the site, they said it was just temporary. Nothing further has been said about the progress of changing it and when it might come back, if at all. Some sellers have created their own substitute by organizing teams that take custom requests. I'm not sure how successful this has been for buyers or sellers, but it's one option for custom ordering on Etsy. One advantage so far has been that some of these teams accept requests for vintage items or supplies. That's not really the same as requesting to have an item made. It's more like a matchmaking service. Another option for custom orders is more time consuming, but more likely to result in success. When you have a item you want somebody to create for you, try doing a search on Etsy to find something similar. Once you find an artisan who sells items similar to what you're looking for (and in the price range you're looking for), send them a message asking if they do custom orders. Keep in mind that the more details you give, the more likely they are to give you what you want and be accurate about the price. 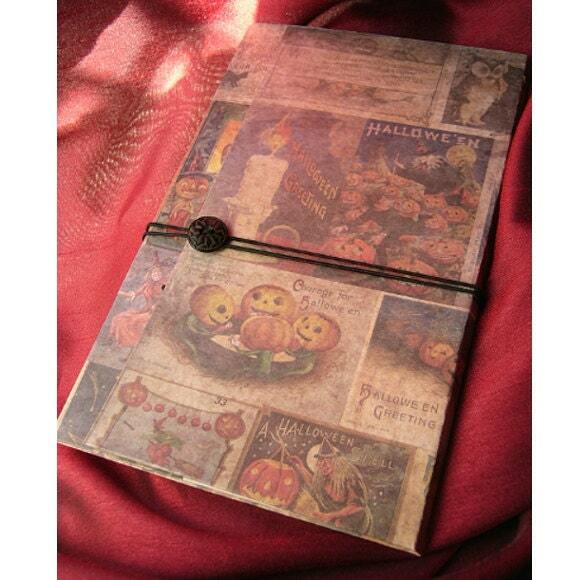 The seller can then put a listing in their shop that is reserved for you so you can pay for the order. While some sellers are willing to accept a deposit or delay payment until the item is completed, a good customer will pay in advance. 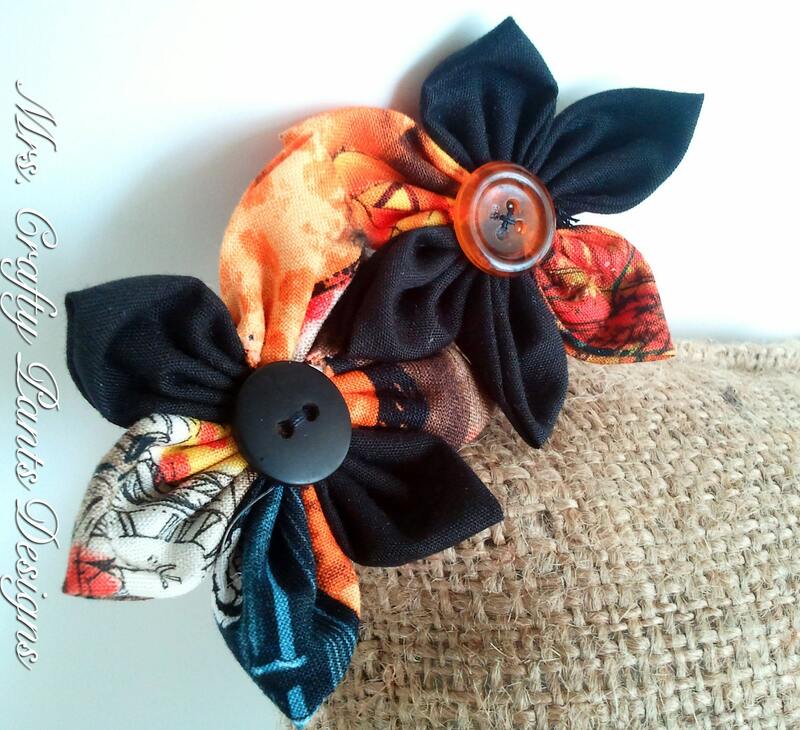 Buyers - are you looking to order custom made items? Sellers - are you taking requests for custom made items? Let me know if you'd like me to add a linky list for shops taking custom orders. Sorry for the late start with today's Etsy Wednesday Linky Party. I had an opportunity this morning I just couldn't pass up. 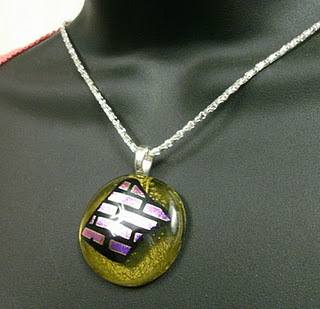 For Heritage's upcoming Scholarship Gala, we asked some of our students to make fused glass necklaces to be auctioned off. Rae Fowler of Wishkraft Glass Designs (sunnyrae(at)comcast.net) opened up her workshop and showed the students how to channel their creativity to create glass masterpieces. 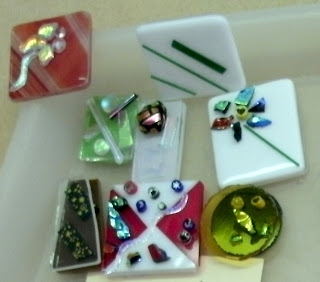 Choosing from a variety of glass blanks, the students then added different pieces of dichroic, patterned, and millefiore glass. Rae will now be putting the glass pieces in the kiln. The firing time varies due to the different thicknesses of glass used for each piece. It doesn't take long to "cook" them at 1500 degrees, but it takes eight hours or more for the kiln to cool down so she can removed the finished piece. Once this process is done, the fused glass pieces will be turned into necklaces and magnets and the students will have the chance to name their creations and choose one to keep for themselves. These pieces have been extremely popular at our past Galas due to their beauty and knowing that one of our students created them. The students take pride in what they've created and get so excited when someone buys it. The money raised provides scholarships for our graduates to attend college or trade school. Having personally known and worked with some of the scholarship recipients, I know how much it means to them to receive support from Heritage, especially since their time in treatment has kept them away from other scholarship opportunities most high schoolers apply for. Take some time to look at Heritage's blog and find out more about this fundraiser and how you can be a part of it. This post has been a long time in getting written. On June 28th, I was able to attend the 2011 Utah Bloggers Summit. It was held at Le Chateau in Provo and the dinner was provided by Utah Celebrations Catering. Being a blogger who is mostly focused on online selling definitely sets me apart from most of the other bloggers I meet up with. I seem to be stuck between a crafts blogger and a business blogger and don't always fit in terribly well. Because I write for four different blogs (this one, my personal one, one for my employer, and one for the Women's Business Network), I try to absorb what information I can and relate it to each of those blogs. The topics for the Bloggers Summit were Social Media, PR & Media Kits, SEO, Being Media Ready, and Working with Brands. I found all of the topics incredibly helpful to me as a blogger, but I wanted to mention a few things I feel will help my fellow online sellers. If you don't have a blog for your online business, you're missing out on some opportunities. Linking to your shop from your blog can improve how you show up in searches - improve your SEO. Decide which keywords you want to rank higher for and make sure they're not too vague. If I go for terms like "tatting" or "Native American jewelry," there will be thousands of other sites to compete with and it's unlikely a searcher will find me. Instead, I should try things like "modern tatted jewelry" or "modern unique Native American jewelry" that include some more specific terms. Use those important keywords wherever you can. Incorporate those terms into what you name your photos. Don't leave your photos with the image number the camera gave it. Rename your photos with descriptive terms that can be picked up by the search engines. Blogging is another place where using your keywords will pay off. Including them in the title of a blog post will help even more. Instead of "My latest creation," try "New tatted necklace with beads has a modern twist." If you don't have a blog, make sure you're including your best keywords in your product descriptions. Etsy has been working to get Google to recognize individual Etsy shops rather than lumping them together like they used to. I've seen shops that put a little paragraph at the bottom of each listing that essentially promotes their business. In the discussions about public relations and working with the media, I learned a few important "commandments." What I enjoy about events like these is the opportunity to socialize and get to know others. The Utah Bloggers Summit is especially helpful since I can meet locals. Even though the round table discussion didn't help me much with this blog, the basic advice given by more veteran bloggers applies to everyone - Be Yourself. People really do feel your sincerity and want to connect with the real you. Enough with the advice - we had tons of fun, too. Le Chateau is absolutely beautiful and the perfect little spot for special events. It's a treasure I didn't know we had in Provo. Metropolitan Salon did some fun hairdos and then 'stache IN A BOX provided silly accessories (especially mustaches) so we could have a zany photo session. Even though we had already eaten plenty of awesome food, the adorable cupcakes by Cupcake Chic were irresistible. They were almost too cute to eat, but I managed to overcome that pretty fast. Yummy! I was excited to find one of the other bloggers wearing these beautiful beaded moccasins. They were a family gift and very precious to her. The best part was that she's worn them so much that the seams are coming apart at the sides. We see that at powwows a lot and duct tape is the repair method of choice most of the time. Hard to say what was cooler - meeting another blogger with cool moccasins or the fact that she'd wear them with her regular clothes.